In a constantly-connected world, we’re never really off--we may leave the workplace, but how often does work follow us home thanks to the phones in our pockets? And if we’re not actively working, there’s still pressure to be thinking about work. How often do we lie awake at night running down in our minds tomorrow’s to-do list? YEP, we’re guilty of that. This pressure to constantly be on is not without consequence. According to a recent study, “8.3 million American adults—about 3.4 percent of the U.S. population—suffer from serious psychological distress” like stress, anxiety, and depression. Stress may seem to have only a minor effect on you, but don’t be fooled—stress can manifest itself in physical symptoms that you may not realize is stress, like headaches, fatigue, stomach problems, sleep difficulty, and more, not to mention the other mental ramifications from constant stress. Reducing stress is a multi-part effort that involves exercise, a healthy diet, mental health awareness, and self-care rituals that serve to relax your mind and body and lower stress. We asked members of our Dallas Iron Fitness team to offer us 5 self-care rituals that you can start TODAY to reduce stress. 1. Start your morning with quiet. Journaling, following along with daily devotional, and/or meditation are all great ways to start your day. 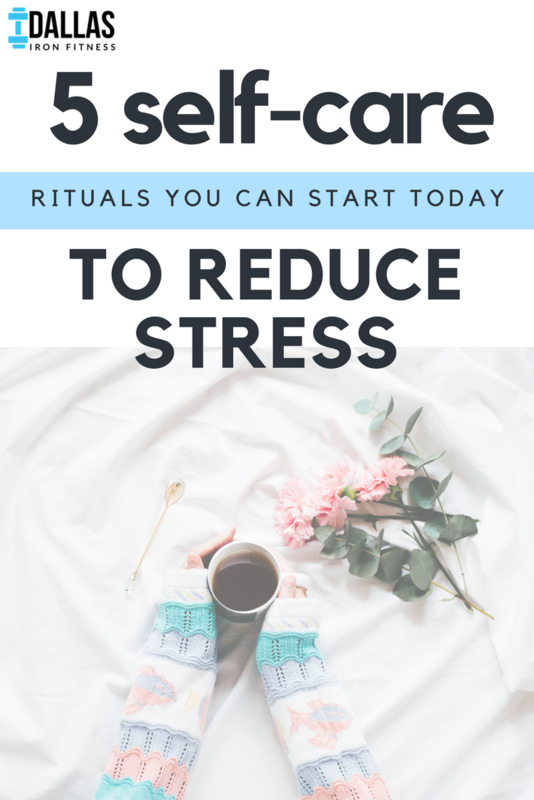 In a world that is constantly noisy and on-the-go, practicing intentional stillness, meditation, or yoga has multiple health advantages, including reduced stress and benefits to your cardiovascular and immune systems. Even Oprah incorporates this self-care routine into her mornings—she reads five inspirational quotes while waiting for her coffee to brew. We’ve all heard the enormous health benefits of that morning cup of coffee, like how it’s loaded with antioxidants and other important nutrients. If you love (read: NEED) your coffee in the morning, consider setting aside time—even if it’s just a few minutes—to savor that coffee, rather than rushing to drink it while you simultaneously put on mascara and respond to your boss’ 5am email (see above, re: why quiet time is so important!). 3. Enjoy a piece of dark chocolate. Dark chocolate, like coffee, is full of antioxidants and nutrients. Why not end your day with a piece of dark chocolate? The perfect indulgence! Dancing is a form of exercise that you won’t even realize is exercise because of how much fun it is—plus, the social component gives you opportunities to make new friends in your community. And studies show that strong social ties reduce stress: “They release the ‘good feeling’ hormones serotonin and oxytocin, both of which counter cortisol.” Always wanted to try salsa? Sign up for that class and reap the stress-reducing benefits of moving your body AND making new friends! Reading makes you smarter, reduces stress, and can help you live longer. According to Yale researchers, “People who read books—fiction or nonfiction, ­poetry or prose—for as little as 30 minutes a day over several years were living an average of two years longer than people who didn’t read anything at all.” You’ll find us digging into that novel that’s been sitting unopened on our bedside table tonight. Exercise is one of the most important self-care rituals you can incorporate into your life. Let Dallas Iron Fitness help you find the perfect fitness routine for you! Health tips & more on the our blog, Facebook, and Instagram!